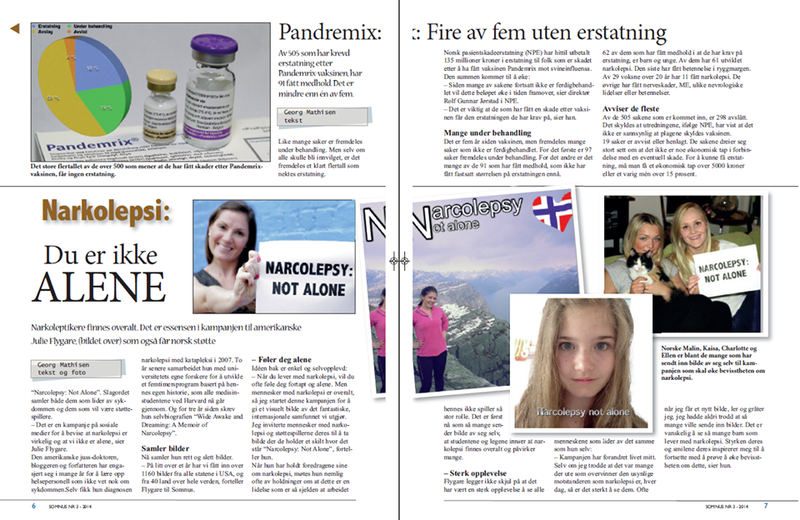 The Norwegian Magazine SOMNUS recently featured our NARCOLEPSY: NOT ALONE campaign! What an exciting honor to share our inspiring international social media community with Norway. The NARCOLEPSY: NOT ALONE currently with over 1,200 photos from all 50 U.S. States and 44 countries around the world, including 6 awesome photos from Norway. Even though I can’t read the text in this Norwegian Magazine, our community’s strength and support is universal and doesn’t need translating. Thank you, SOMNUS and all our friends in Norway participating and raising awareness around the globe.